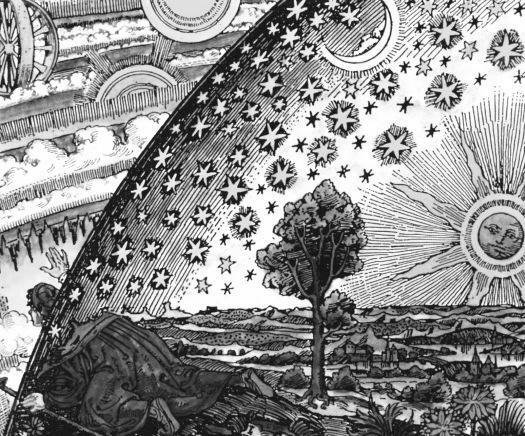 It is worth noting that the greatest distance is to be found between the physical and aggressive state of existence when fear could be used as a coercive force and the peaceful and productive state where reason prevails and knowledge is the driving force of man's actions. The state of freedom of people, in terms of thought and actions, is greatest where there is less fear and aggression and where the resolution and settlement of disputes are secured through peaceful means. During the preparation of the article on "Speaking truth to power" we realised that it is necessary to describe the structural impediments against those who would attempt to state the truth be they whistle blowers, politicians or members of the public. These involve the evolving manipulation by legislators of an incremental dismatling of constitutional provisions which have remained indiscernible to most of the electorate because such changes have benefitted the media who should have been calling attention to the establishment of such extra-constitutional devices. The results include, for example, the removal of essential safeguards in the financial regulatory environments under the Thatcher Regime in the UK and more drastically under the Clinton Administrationin the USA which led finally to the 2007 global financial fiasco1. Therefore we have reproduced below content that first appeared in Constitutional Economics in 2010 and updated in 2014.1. This helps establish the dynamics of the background that shapes the framework of current public platforms "for free and open debate". The overall picture is discouraging but there are precedents from the past when the personal dangers individuals faced under tyrannical regimes for speaking truth to power were as great but where the approach used was particularly effective. These will be covered in the article, "Speaking truth to power". The main agents of actions than attempt to remain beyond the constraints of constitutional provisions are today the Military Industrial and Corporate Financial Complexes whose voice is sections of the media and whose principal agents for facilitating actions in their interest are political parties and specific politicians who introduce such interests, without reference to the electorate, into Parliamentary debate or secure influence through voting in Parliament or even Cabinet whose "collective" position does not expose either the discussion nor who voted for what. The specific motivation of political parties and politicians to act in line with extra-constitutional desires is normally enhanced power, money, or both. Beyond the national arena, the same basic modus operandi is applied in the foreign affairs domain through cash payments paid directly or indirectly to politicians by agents of "friendly" and "unfriendly" countries through what is known as "cash diplomacy". This has been applied by the USA in Central Europe in terms of influencing European Union "positions". This is used effectively by Israel's agents in the United States on members of Congress, Senate, Presidential candidates and the President and by Russia in all ex-Soviet countries in th European Union and Serbian enclaves in the Balkans. A persistent example of "successful" extra-constitutional activities which affect cross-border political decision-making include criminal gang operations and drug cartels. Although media promote the role of a free press in maintaining a thriving democracy (see recent post-Leveson media positions in attempting to avoid a legally regulated solution), they, in large, represent the views of those who fund them. This, combined with the high degree of concentration of the media, results in very little diversity in views and these being "supported" through the use of biased or highly selected information. This is a reason why the political parties themselves have such bland and unimaginative agendas which fail to excite and inspire. Much of the extra-constitutional behind-the-scenes manipulations are in fact censored, not by the government, but through self-censorship by editors and media owners who do not want to compromise their cash flow. As a result there is a serious confusion between arguments for a free press and those for the free flow of information that constituents need to take decisions in their interest, as opposed to the interest of the corporate, media and political factions. In the background, the intelligence services have a formal role that is largely to do with spying, counter intelligence are providing critical information for military interventions. However, as the social fabric of a country is undermined by inappropriate economic policies and constraints on freedom there is a natural atomization in the support for political parties who previously survived on the basis of well defined philosophical positions. This results in the parties transitioning from being bodies that receive a substantive proportion of electorate support to factional minorities who need to rely on extra-constitutional means to gain and remain in power. In the current circumstances (2014) under the current first-past-the-post electoral system a party with just over 20% of the electorate support can gain an absolute majority in Parliament capable of imposing dogma on the majority (the 80% that did not vote for the governing party). All of the parties in the United Kingdom are now minority factions with an aggregate national membership of less than 0.5% of the electorate. This creates serious temptations. One is that the governing party, invariably overseeing failed economic policies and social discontent are tempted into using the intelligence services to spy on citizens with a view to detecting sources of opposition. This can also include the request for "reports" on political rivals and their activities. The foreign policy fiascos that have occurred during the last 20 years, and in particular the "war on terror", has resulted in a series of restrictions on freedom resulting from the ability to apprehend and hold individuals without justification other than the action being sanctioned under "anti-terrorism legislation". This evolution is justified as the necessary trade-off between security and freedom and/or privacy. The intelligence services are called into play here to begin to collect information on the people of the country. However, since such acts are being carried out in the name of a "government" that does not enjoy the support of the majority of the population, there is a natural question of the legitimacy of the intelligence actions and activities. In whose names are they acting? The danger is that the intelligence services are as aware as anyone else of the minority factional status of political parties and the question of legitimacy. It is well known that agents have political allegiances so the massaging of intelligence becomes a constant danger just as the destination and use of key information cannot be controlled by the "peoples' representatives. It also means that what constitutes legal court authorised or ad hoc arbitrary surveillance of members of the public is virtually impossible to monitor and control. Intelligence agencies denied any surveillance of the public until Julian Assange and Edward Snowden exposed the reality so now the approach is to act out an earnest wish to conduct "honest" and open debates so as to solicit the help of large private web-based information corporations, who in fact, are already collaborating with intelligence agencies. The public today are too well informed to fall for this ruse. A result is widening disinformation with the infamous "dodgy dossier", signed by Tony Blair, being a amateur and crude example. More troubling is the fact that such an incompetent document passed for an intelligence report and even worse was able to convince a collective ignorance of the British House of Commons to justify the calamitous invasion of Iraq. This led to the unnecessary deaths of UK servicemen and women and the murder of thousands of innocents in Iraq. Launched, it should be emphasized , by a minority factional government that had the support of less than 20% of the British electorate. The direct involvement of web service companies, in spite of their introduction of super-encryption to "protect privacy", needs to be treated with extreme caution. The governments will use the shareholder value of such companies as a bargaining chip in "encouraging" them to "collaborate" with the intelligence agencies, largely through the threat of applying more effective moves to stop tax avoidance Obvious examples include such companies as Google, Apple, Facebook, Twitter, Amazon, Microsoft and others. See the recent report by Agence Presse Européene: "The protection of constituents under a regime of freedom of expression"
Extra-Constitutionalism is the carrying out of actions that serve the interests of specific groups that are facilitated by avoiding transparent participatory processes involving the electorate but involving specific interest groups who obtain influence by funding advertising and paid support for media organizations and by paying off political parties and key politicians. Besides politicians and legislators, extra-constitutional actions can involve people who work for any agency of governance that plays a constitutional role, for example, regulatory authorities, prosecutors, judges and the police. The current Leveson enquiry into "phone hacking" is exposing many examples of extra-constitutional behaviour on the part of journalists and police involving cash payments, the intimidation of members of the public, invasion of privacy and a misrepresentation of the facts. The close relationship between politicians and media owners is an obvious example of the vulnerability of politicians to pressure and highlighting the ease with which extra-constitutional decisions can be formulated and taken. Many serious issues are often swept under the carpet by classifying them as topics "of national interest" as a basis for preventing the public discovering certain information. The reason political parties are so vulnerable is that without corporate financial support and media coverage it would be extremely difficult for them to maintain their visibility and hold onto power. Today the three main political parties in the United Kingdom have a combined membership of less than 0.5% of the British electorate. By maintaining the first-past-the-post electoral system that only counts votes as opposed to total electorate support in any constituency the Blair and Brown Labour governments lasted 13 years with less than 19% of the electorate's support but with a Parliamentary majority. In other words Parliament was completely subservient to the factional minority whereas the preferences of the remaining 81% of the population, the majority, were ignored. This state of affairs in itself depending upon how democracy is defined, could be considered to be extra-constitutional. The more recent Cameron Government that is a coalition only counts on 39% of the electorate's support and imposes its will on the remaining 61% of the electorate (the majority). It is only through sufficient corporate support, and media who support the corporate line, that political parties, who also follow the same corporate-inspired thinking, who can lever themselves from possessing just as membership of no more than 0.5% of the electorate into amassing, each just around 20% of electoral support can, through the first-past-the-post vote counting gain an absolute majority in Parliament. Clearly corporate support and media relations combined with first-past-the-post, are the very essence of political party survival; electoral support is almost a secondary issue. The problem with this state of affairs is that political parties clearly have a priority of seeking to satisfy corporate supporters and the media and then have the task of selling policies derived from these interests to the electorate, as policies of interest to the electorate. The result is not a Parliament of the "will of the people" but a system that marginalizes the majority of the electorate. President Eisenhower warned in 1961 of the nature of the rising Military-Industrial complex as a force that would undermine democratic process through undue influence on governance and the direction of policy. He did not call this an extra-constitutional force but this is what he described. In parallel with the growth in illicit influence of the Military-Industrial Complex, an older Corporate-Financial Complex has also grown in size since 1945 and expanding rapidly since the 1970s. Both of these complexes have a significant influence over political parties and specific agents in the form of politicians. The agents act largely in exchange for money and influence on a personal or party basis. A more obvious recent extra-constitutional force has been drug cartels who, in spite of politicians declarations of a "war on drugs" have been seen to expand and have destroyed communities throughout the world both where drugs originate and where they are consumed. In spite of these ongoing tragedies, cartels continue to use major banks to launder their earnings, at a profit to the banks. Indeed, it was alleged that at early stages of the recent crisis there was a significant fall in financial transactions and an increasing proportion of active transactions involved "drug money" laundering. Therefore one sees a multi-layered extra-constitutional economy that has no conscience or consideration of the interests of the general public. And politicians, "representative" of the general pubic, do little to dismantle these operations. One of the principal characteristics of these types of corruption is the relative immunity from prosecution of the perpetrators of crime under such extra-constitutional agreements. For example, the relative immunity of US service personnel in foreign bases, the lack of serious investigation and prosecution of financial fraud and crime that was associated with the activities of many financial intermediaries associated with the current financial crisis and the abuse of the public by some of the media through phone hacking, intimidation and publication of lies. The significance of extra-constitutionalism to constitutional economics is that such activities can result in significant impacts on the economy and which are initiated without appropriate constitutional oversight. Thus the military action in Iraq was never adequately justified in constitutional terms and diverted resources from arguably more important priorities. The latest financial crisis has involved segments of the Corporate-Financial Complex who rather than losing their capital because of bad management have been handed massive transfers of money lent by the government and to be paid for through austerity and suffering of the electorate. The prejudice suffered by the public at large was a result of the willingness of politicians to award banks money in compensation for irresponsible decisions and thereby covert this private debt, which should have remained lost, by an advance of funds and a significant and precarious rise in sovereign debt. The British Government introduced an expanded utilization of private security firms to support "legal services". This situation has been used to structure devices whereby local authorities confiscate property of people who are being evicted. This is achieved through the private security firms presenting extortionate invoices for eviction and the local authority using the property to pay for the costs of eviction from their own land. These actions are usually "authorised" by lay magistrates rather than judges and even in the case of judges there is no community oversight such as a jury. This particular technique has been used repeatedly against the Roma minority leaving their children with a reduced or no inheritance and enforcing impoverishment. The Minority Principle contains specific provisions that prevent this form of prejudicial enforced economic transaction. One of the cross relationships between extra-constitutional events include the fact that before the current financial crisis there was often reference, alleging, sometimes in jest, that some major derivative traders were cocaine addicts. Cocaine has the psychological effect of making people extremely confident or even invincible. Following the current financial debacle it has come to light that many trades were illogical and could only have been undertaken by those with an irrational assumption of future development in the fields of the derivatives concerned. It is therefore notable that the alleged cocaine dimension commonly referred to in the past has never been mentioned since the results of decisions emerged in the form of the current crisis; it would seem that this might be something worth investigating to try and find out whether there are cross effects between extra-constitutional activities. Recent legislation in the USA has militarised some aspects of civil affairs including imprisonment without Habeas Corpus. Some even interpret this to have been motivated by the Corporate-Financial Complex fearing a backlash from the public in the wake of the current financial crisis. Previous emergency legislation referring to terrorist activities has been used to imprison people for civil offenses that were not connected to terrorism. 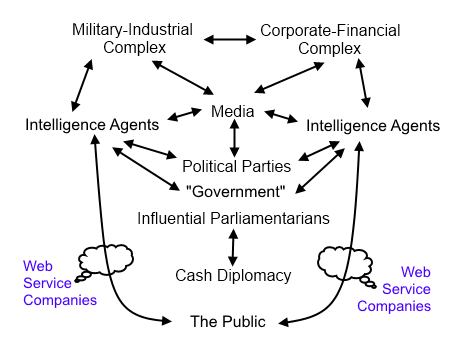 In addition to these there are cross relationships between the Military-Industrial Complex and the Corporate-Financial Complex activities which have resulted in massive resources being diverted into activities that bring little benefit to the activities falling within the constitutional domain. The general dependency of the media on government information and advertising has resulted in extra-constitutional activities gaining a non-critical coverage in the mainstream media through self-censorship. This restricts the full range of information to which an electorate should be gaining access to participate in their public life. Extra-constitutional activities undermine the democratic imperative of the electorate having a more effective control over the events that impact their lives both in social and economic terms. There is a long way to go in arriving at a state of affairs where rational discussion and decision-making power over what are currently secret deals between politicians and interest groups is placed in the hands of genuine representatives of the people. Until this point is reached significant aspects of economic decision-making will remain outside the constitutional domain and sustain an unacceptable democratic deficit; maintaining a feudal system rather than transparent democracy where the representative assemblies represent the will of the people. correction to total membership of parties figure from 1.5% to 0.5% of the electorate, 20th October, 2014. 1 APE has requested SEEL strategic economic analysts to provide a "trace" on the stated links between the 2007 financial fiasco and political decisions referred to above. We might use this input to create an article in this series to provide addidional evidence for statements made. 2 Constitutional Economics was acquired by APE in 2017 and is being incorporated into an APE provision on Economic policy. This will be publicised when launched.